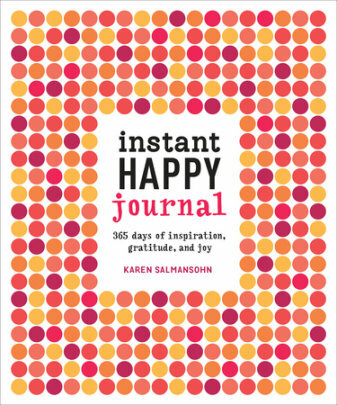 This colorful diary inspires journalers to apply happiness guru Karen Salmansohn'sInstant Happy principles to their everyday lives, with 365 prompts to encourage a year of gratitude. On the heels of Karen Salmansohn's wildly popular gift book Instant Happy comes this happiness journal, with daily prompts to help you think about and apply happiness wisdom to your own life. Each page features a specific intention, inspiring quote, surprising scientific fact, or thought-provoking question to ponder. When you approach your day with Salmansohn's "happiness prompters" in mind, you amp up your ability to notice (and create!) many more joyous moments in your day. But that's just half of what it takes to live a supremely happy life. 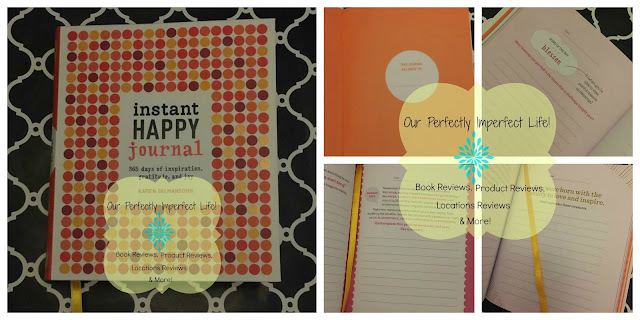 This journal teaches the top two habits of happy people: to naturally set their intention to enjoy a happy day, then end the day reflecting on what made them happy. When you end your day writing about what went right, you further strengthen your happiness mindset. With fill-in dates so that you can write and reflect at your own pace, this little journal features a graphic design and fresh attitude perfect for today's modern happiness-seeker. The cover of this book is what drew me in. It's so bright and well...happy looking. I knew that I had to add it to my collection of books! When this book arrived, I looked through it right away. It is smaller than I thought it would be, but it is the perfect size to keep on my night stand. When you open the book you will see a "This Journal belongs to". Each page has a "Date:__________" section at the top so you can write in the date for that day. It also has a satin bookmark attached to the book so you can keep your place. I absolutely love this journal and can't wait to start using it on 1, Jan 2016! Of course you don't HAVE to wait until the new year, you can grab yourself a copy of this book and start right away!